In my series of explaining a few functions of several variables, their analysis, which is included in the differential geometry, today I want to talk about something, in itself, little known, Lagrange multiplier. Lagrange was a great mathematician and physicist of the eighteenth and nineteenth century to whose name we have many contributions such as Lagrangian mechanics (the one we give children in school), Lagrange’s known points where the sum of forces gives us only gravity Or the whole theme of equations and quadratic forms with their classification among many others. 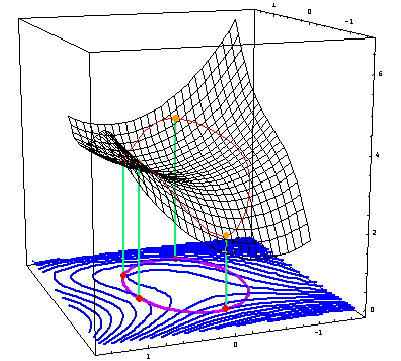 I will highlight what is called the Lagrange multiplier and that serves to calculate maximum and minimum (and saddle points) functions of several variables through the use of gradients. Obviously, I imagine that all of you will know what are maximum and minimum in function. Briefly and in a single variable function, if we take an interval (a range, either open or closed or semi closed or semi open), we can limit the function to a value either a very low value (a minimum) or a Very high value (maximum). That is to say, the function will take a value which the rest of values ​​of said function in the interval are (in the case of a minimum) greater than this always or (for the case of a maximum) smaller than this one. Mathematically and easier to understand, in the case of a maximum. Well, for functions of several variables, the case is complicated, precisely by having several variables, and we need what is called a restriction function. Now you will see why. Of course, it being clear that the gradient of a function is a vector and therefore is normal to the curve. So how can we calculate the minimums and maximums of a function of several variables? Simple, as we have said, this multiplier needs a restriction function that is the function that helps us calculate it and the one that gives us the subject. Let f be a function of several variables, for example 3 variables x, y, z which are independent for function f are related to through the function g in the form g (x, y, z) = c . We can see that the g function describes curves at a constant value. Where, is the Lagrange multiplier that can be positive or negative and as we are calculating on the function f indicates that the point(s) of the multiplier must be minimal or maxima (or saddle points). But how do we know they are? Simple, the best way is to see the function, where it goes, ie calculate the value of the function in other points and observe the value that also takes the function in the calculated points, in the end is the easiest way to know Type of point is.